Geoengineering Solar Radiation Management (SRM) advocates believe that spraying the sky with man-made particles will reflect sunlight back into space and cool the planet. These scientists are planning. developing, modeling, and in some cases testing various geoengineering devices with intentions to deploy globally, despite the fact that it will likely kill many poor people. Surprisingly, no geoengineering advocate or researcher will admit what is obvious to so many: the sky is already being covered with blankets of man-made clouds. The young contrails, which appear as a spring shape and sharp lines in the first image, gradually spread into cirrus clouds, which appear as bright white areas in the lower images. From a public perception standpoint, you have a multifaceted group of concerned citizens collectively labelled “Chemtrail Conspiracy” fans, in some sort of Orwellian group-think nightmare. Ask two “conspiracy” believers, “why is the sky covered in cross-hatched man-made clouds?” and you will likely get two totally different answers. No two people think alike and the day we all agree is the day we could all be wrong. Is it possible that someone might be doing geoengineering, and we would not even know it? But is it possible that a nation could avoid both the insurmountable obstacle of obtaining world agreement, and the possibility of severe sanctions over unilateral action, by doing it in a manner that could not be detected? Given that the actual results of geoengineering would most likely be lost in the noise, is it actually technically possible to perform SRM geoengineering on a large scale in a manner that could not be detected? Or will all the possible schemes be impossible to hide, being either too visible in deployment, or leaving some tell-tale physical or chemical signature? One could approach the question from two directions, firstly from the point of view of the rogue nation; if you were to devise a clandestine yet effective SRM scheme, then what would it consist of? Modifications to the nation’s domestic jet fuel? A secret fleet of spray tankers operating from a remote base? Ballistic big guns in the wilderness? Atomic bombs in volcanoes? Secondly, from the point of view of the world community, if you suspect such a thing might happen (or even already be happening) then how do you go about detecting it? Unaccounted radiative forcing changes? Changes in atmospheric sulphur loading? If we get a moratorium on SRM, then how do we “trust, but verify”. One of the voices emerging in the SRM debate is that of ‘chemtrails’ believers. This small group believes that organizations, such as governments, are already distributing chemicals in the atmosphere for a variety of purposes, ranging from culling the population to mind control. We found that 2.6% of the subjects believe that it is completely true that the government has a secret program that uses airplanes to put harmful chemicals into the air, and 14% of the sample believes that this is partly true. The most common purpose ascribed to the supposed spraying is actually covert geoengineering. A better understanding of what covert geoengineering would entail, and how it might be detected, would allow a more rigorous debunking of the various conspiracy theories. “In summary, although very large albedo increases are potentially detectable, interannual albedo variability overwhelms the maximum conceivable increases associated with the leading proposed SRM schemes.” reference: Detection limits of albedo changes induced by climate engineering. Nature Climate Change, 4, 93-98. doi:10.1038/NCLIMATE2076. That’s right people, the best scientific sensors and computer models on the planet can’t tell the difference between nature and man-made interventions. All jokes aside, that is really scary. Trust but verify, oh wait we can’t. Now the plot thickens: If scientists cannot tell if the sky is already being geoengineered by some secret organization, then how do we know they are not? A troubling problem was revealed after the September 11, 2001 bombings. With skies sans-contrails, scientists figured out that contrails might be making our days colder and our nights warmer. For the first time since the jet age began, virtually all aircraft were grounded over the United States for three days. 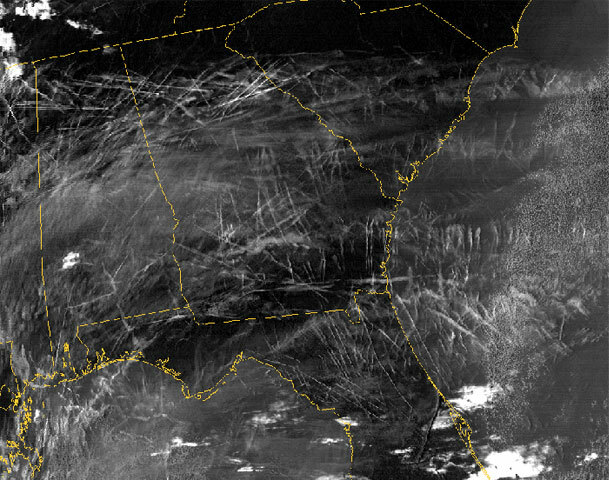 Even as they tried like the rest of us to absorb the enormity of the terrorist attacks, climatologists realized they had an unprecedented opportunity to scrutinize individual contrails, and several studies were quickly launched. These results suggest that contrails can suppress both daytime highs (by reflecting sunlight back to space) and nighttime lows (by trapping radiated heat). That is, they can be both cooling and warming clouds. But what is the net effect? Do they cool more than they warm, or vice versa? “Well, the assumption is a net warming,” Travis says, “but there is a lot of argument still going on about how much of a warming effect they produce.” source: The Contrails Effect from NOVA’s special Dimming The Sun. If contrails were covert geoengineering to cool the planet, they are failing to work as planned. Scientists are trying to wrap their heads around the real effects of these artificial clouds and incorporate them into their climate models. The Federal Aviation Administration has launched the Aviation Climate Change Research Initiative (ACCRI) to study contrails in an attempt to predict and possibly reduce their effect on climate change. I told the good doctor that “The true sign of intelligence is to be able to meet a person on their level and be understood” then made the the point that their needs to be less quibbling over verbiage. Just sayin’… back to the story. The sky is coated in man-made plumes, people are pissed, many for the wrong reasons, and few pragmatic solutions are on the horizon. Removing all speculation from the equation, let us try and figure out a cause for the current chemtrail confusion. According to Mick West and a lengthy Google time search, the word “chemtrail” first popped up in 1997 with many of the first conspiracies attributing persistent contrails to the military’s use of JP-8 fuel, so naturally I started searching there for a possible cause. It turns out that a series of interesting coincidences occurred between 1988-1997 that either contributed heavily to the persistent contrail problem or was a coordinated plan to intentionally cloud the skies. Have you ever heard of the Single Fuel Concept (SFC)? The North Atlantic Treaty Organization (NATO) comprises 28 states with one common problem, a hefty gas bill. In order to simplify shipping, reduce expenses, and alleviate some serious safety issues with JP-4, all NATO forces (except Turkey) switched to JP-8 as their primary jet fuel by 1988. US Army Lt. Colonel Russell K. Garrett from the Industrial College of the Armed Forces suggested the use of JP-8 in M-1 Abrams tanks in his paper, “Is a Single Fuel on the Battlefield Still a Viable Option?” April 1993. He stated that due to the low flash point of JP-4, small arms fire from Vietnamese soldiers created sparks that caused grounded fighter jets to explode. Also, March 23, 1994 an F-16D accidentally collided with a C-130 killing 23 and injuring 80 soldiers. The C-130 was able to land and the two F-16D pilots where able to eject, unfortunately the damaged F-16D crashed into two C-141 Starlifters on the runway. 500 paratroopers died in the fireball which was attributed largely to the use of JP-4 fuel in all three planes. The Army’s problem had to due with D-2 (F-54) diesel fuel. Back in the 1980’s, M-1 Abrams tanks deployed to Germany wouldn’t start when it got too cold. Apparently when D-2 got too cold wax would form in the gas tanks and fuel lines. The solution dubbed “M1 fuel mix” was to mix the F-54 diesel fuel with either JP-4 or JP-8 and call it NATO F-65. The SFC was first implemented in December 1989, when JP5 was used as the single fuel during Operation Just Cause in Panama. In August 1990, DOD implemented the SFC by providing Jet A1 (JP8 without its three mandatory additives) for U.S. forces in Operations Desert Shield and Desert Storm. During those operations, some Air Force units were located on bases where only JP4, which could not be used in ground vehicles and equipment, was available. Some Army units requested diesel fuel instead of JP8 because JP8 did not make acceptable smoke in the M1 Abrams’ exhaust-system smoke generators. Further compounding the problems was the lack of training of ground units, which would have reduced their initial concerns about using aviation fuels in ground vehicles and equipment. Despite these problems, the SFC was considered a success. Garrett goes on to suggest JP-8 as a single fuel option for all “land-based vehicles” which includes anything on a runway. In order to pull this off Garrett states that many vehicles and equipment will need alterations which would occur over a short time span. In April of 1994, Garrett’s idea would be resonated by US Army Colonel James E. Wright, also from the Industrial College of the Armed Forces. His paper titled “What Are the Impacts to National Security for the Department of Defense to Comply With the Mobility Fuel Requirements in the Clean Air Act of 1990?” considers the legal ramification of putting JP-8 in ground-based vehicles. Turns out the EPA doesn’t allow diesel fuel with more than 0.05% sulfur in trucks, and JP-8’s sulfur content was somewhere between 0.2 and 0.3%. Interestingly, given the ability to say “To hell with the EPA” the good Colonel opted for promoting the use of Low-Sulfur fuels in the future to “lead the world” on being clean. Bravo sir. Following the switch to JP-8 in 1988, the Air Force Research Lab conducted tests on a new type of fuel additive in 1989. The High Temperature Thermal Stability (HiTTS) additive was designed to make JP-8 perform like JP-TS, a special fuel used in high flying spyplanes like the U2. At the time, JP-8 cost around $0.61 per gallon and JP-TS costing around $3.25 per gallon, the AFRL’s HiTTS additive would give all the performance of JP-TS for a few additional pennies per gallon. In 1989, the Propulsion Directorate began evaluating jet fuel additives to reduce coking and maintenance costs in aircraft engines and fuel systems. In 1994, the directorate selected an additive, designated SPECxAID 8Q462, to test on F-16s with Pratt & Whitney F100-PW-200 engines. The resultant additized fuel, designated JP-8+100, raises the fuel’s thermal stability up to 100∞ F hotter without increasing its propensity to form coke. The two-year test program using JP-8+100 resulted in a significant reduction in coke-related maintenance. To date, thousands of Air Force aircraft, as well as numerous aircraft of allied nations, successfully use JP-8+100. The Federal Aviation Administration (FAA) recently approved the use of the Betz Dearborn SPEC×AID 8Q462 fuel additive and its commercial equivalents for all Pratt & Whitney commercial aircraft turbine engines. The FAA’s approval of the additive for use in commercial engines is a huge step towards wide use in the commercial aviation industry.All Air Force aircraft, with the exception of the high-altitude U-2 reconnaissance aircraft, use JP-8 fuel. The U-2 uses jet propellant, thermally stable (JP-TS) fuel because of the decreased freeze point and elevated thermal stability requirements of the U-2’s higher altitude flights. JP-8+100 meets the thermal stability requirements but falls short of JP-TS low-temperature capabilities. The directorate is starting the second of a five-year program to improve the low-temperature properties of JP-8 fuel through the use of additives. Jet fuel freezes, similar to gelatin, and firms but does not solidify like frozen water. The directorate developed a new fuel, JP-8+100LT (LT for low temperature), that will suppress crystal growth and adherence. Freezing crystals, like building blocks, stack onto each other. As they group together, they become too large to pass through fuel screens and filters (see Figure 1). JP-8+100LT will prevent crystals from building into larger structures and allow fuel to continue flowing through all parts of a system (see Figure 2). Cold flow enhancers prevent crystal growth, enabling small crystals to remain suspended and flowable in liquid fuel. Jet fuel cost is one driving factor for this research. The price for JP-8 in fiscal year 2000 was $0.61/gal. The cost of JP-TS was $3.25/gal. The cold flow additive package for JP-8 will cost only pennies per gallon, resulting in great savings. This effort promises to reduce U-2 fuel cost by as much as 80%. Other nations and commercial airlines expressed interest in the fuel additive program. Currently, commercial jet fuel is produced from only the highest grade of petroleum (top 10% of a barrel of oil) to meet temperature range and thermal stability requirements. This makes the price of commercial jet fuels very expensive. Airlines can significantly reduce their operating costs through the use of this cold flow additive, which can extend the temperature range of jet fuel produced from lower grades of petroleum. Due to international interest in this technology, the directorate’s research team presented a paper at the International Association for the Stability and Handling of Jet Fuels Symposium in Graz, Austria. The directorate recently opened a new cold flow fuel laboratory at Wright-Patterson AFB, Ohio. It houses a cold stage microscope, differential scanning calorimeter, and the low-temperature fuel wing tank simulator. A larger scale simulator, currently under construction, will incorporate a model of the U-2 wing, but will also fully adapt to accommodate future testing for other planes, such as the Global Hawk and other technically advanced aircraft. Transition of this new fuel to operational Air Force units is under way. One method is to mix LT with +100 and distribute the mixture to operational units. JP-8+100LT may also have applications in other military vehicles. Ms. Cynthia Obringer and 1Lt Kirsten Wohlwend of the Air Force Research Laboratory’s Propulsion Directorate wrote this article. For more information contact TECH CONNECT at (800) 203-6451 or place a request at http://www.afrl.af.mil/techconn/index.htm. Reference document PR-00-08. This new HiTTS additive was first tested at Edwards AFB in September 1994, and tested again again in May of 1997 at the Air Education and Training Command (AETC) with help from Raytheon and their T-1A jet. According to a paper titled “JP-8+100: The Developement of High Thermal Stability Jet Fuel” dated October 13-17, 1997, over 1000 US Air Force jets were already using the HiTTS laden JP-8+100 and the military planned to expand its use to all planes by 1999. Could this be the coincidence of the century or did the implementation of HiTTS and JP-8+100 lead to the increased contrail problem? Another side-effect of the switch to the HiTTS additive came from its ability to mimic another additive already in the fuel since 1962. Stadis-450, aka DINNSA which is a barium salt, had to be reformulated to work with HiTTS additives. All of these changes coincide with the chemtrail conspiracy start date in 1997, but there’s more. Jet A-1 - A grade of, kerosene type, aviation turbine fuel to Specification ASTM D1655, NATO F-35. Freezing point minus 47°C max. Similar to AVTUR. Jet B - A wide cut type aviation turbine fuel to Specification ASTM D1655. Freezing point minus 50°C max. JP-1 - Obsolete aviation turbine kerosene similar to AVTUR but with a lower freezing point (-60°C max). JP-2 - Obsolete experimental wide range distillate fuel. JP-3 - A wide cut gasoline type fuel formerly used by USAF, now replaced by JP-4. JP-4 - A wide cut gasoline type fuel. Specification MIL-T-5624, interchangeable with AVTAG/FSII, NATO F-40. JP-5 - Aviation kerosene, high flash point type, for ship-borne aircraft. Specification MIL-T-5624, interchangeable with AVCAT/FSII, NATO F-44. JP-6 - Obsolete experimental kerosene type fuel of high thermal stability. JP-7 - A kerosene type fuel of low volatility and high thermal stability. Specification MIL-T-38219. JP-8 - Aviation kerosene, Specification MIL-T-83133, NATO F-34 UK DEF STAN 91-87 (AVTUR/FSII). JP-8 +100 - Aviation kerosene, Specification MIL-DTL-83133H (JP-8) MIL-T-83133 (F-34), interchangeable with AVTUR/FSII, is NATO F-34 plus a High Temperature Thermal Stability (HiTTS) additive and designated NATO F-37. JP-9 - A high density hydrocarbon fuel composed of three different components. Specification MIL-P-87107. Intended for use in special applications. JP-10 - A high density hydrocarbon fuel composed solely of exo-tetrahydrodi(cyclopentadiene). Specification MIL-P-87107. Intended for use in special applications such as ramjets. JP-TS - A kerosene type fuel of low distillation end point (260°C) and high thermal stability. Specification MIL-T-25524. The most often used fuels are Jet A and Jet A-1 in commercial and passenger aircraft, JP-8 for most of the military aircraft, and JP-5 for carrier-based jets. Corrosion Inhibitor/Lubricity Improver (CI/LI) – Additive contains a polar group that adheres to metal surfaces, forming a thin surface film of the additive, thereby improving lubricity and inhibiting corrosion. Most CI/LI additives contain dilinoleic acid. Fuel System Icing Inhibitor (FSII) - FSII is chemically composed of di-ethylene glycol monomethylether (di-EGME) which contains both a hydrophobic (water hating) and hydrophilic (water loving) portion. This structure allows the molecule to be soluble in both nonpolar fuel and in highly polar water. Having a higher solubility in water the FSII works by combining with any free water that forms and lowering the freezing point of the mixture so that no ice crystals are formed. It also has bio-stat properties thus preventing bio-material from growing. Static Dissipater Additive (SDA) - Stadis ® 450 increases the conductivity of the fuel, thereby increasing the rate of static conductivity of the fuel, thereby increasing the rate of static charge dissipation. Antioxidants (AO) - Required in fuels that have hydrotreated components. Antioxidants improve storage stability by preventing the formation of peroxides, gums, and insoluble particulates. Peroxides attack elastomeric fuel system parts, gums can cause engine deposits, and insoluble particulates can cause engine wear and plug fuel filters. AOs function as hydrogen atom donors that stop the oxidation process. As you can see, it’s very complicated. Many different fuel types, many different additives. Who’s responsible for organizing and regulating the chemicals that end up in our skies? The NATO Pipeline Committee (NPC) - AC/112 determines the standards for jet fuel and approved additives across all 28 NATO member states. Aviation Fuels and Lubricants Working Party - AC/112 (AVIATIONF&LWP). Petroleum Handling Equipment Working Group - AC/112 (PHEWG), which provides the focal point and forum to review and improve the effectiveness of NATO forces through standardization of the facilities, equipment (including Tactical Fuels Handling Equipment (TFHE)) and procedures for handling fuels and lubricants products set out in NATO Standardization Agreement (STANAG)1135. Scope: This specification covers three grades of kerosene type aviation turbine fuel, JP-8 (NATO F-34), NATO F-35, and JP-8+100 (NATO F-37). This specification was thoroughly reviewed as a part of acquisition reform. While most of the requirements were converted to performance terms, due to the military-unique nature of the product (see 6.1) and the need for compatibility with deployed systems, it was determined that not all requirements could be converted. The issuance of this specification as “detail” is not intended to constrain technology advances in future systems. When UK Standards are applied to civilian Jet A-1 fuel, the ASTM D1655 Standards for all passenger and commercial airlines tend to follow suite. Just when you thought it couldn’t get in freakier, biofuels enter the mix around 2000. 1994-1999 - Influence of fuel sulfur on the composition of aircraft exhaust plumes: The experiments SULFUR 1–7 Fuel sulfur content tested as a source of contrail production. 1995 - Owning the Weather in 2025 US military dreams of weather control, mentions using Carbon Black Dust by 2005. March 1997 - Weather Modification Test Tech Symposium US military brags about their abilities to modify the weather, including the ability to CREATE or SUPPRESS Contrails! The DoD began the initiative in 2009 with demonstrations at four Air Force locations. Fusion-powered planes? High Hopes – Can Compact Fusion Unlock New Power For Space And Air Transport? I still have many things I need to research. This report is far from finished, however I hope this serves as a reference for those dedicated individuals seeking the truth in a very cloudy situation. Covert geoengineering is currently undetectable. Aviation fuel is a complex soup. Jet fuels and their additives are tested for many, many things, including Contrail production. The military claims the ability to both create and suppress contrails, yet there is no demand for all contrails to be removed, they are simply studied in order to use them. Scientists are screaming bloody murder over the “uncertainties” surrounding Contrail Cirrus while bragging about their “climate change” models. The sky is coated in man-made clouds. Contrails, Geoengineering, and the NATO Single Fuel Concept by Jim Lee is licensed under a Creative Commons Attribution-NonCommercial-ShareAlike 4.0 International License. Based on a work at climateviewer.com/. Permissions beyond the scope of this license may be available at climateviewer.com/terms.